Our Master student Laura Scheuer was awarded the prize for best poster at the MSNOWS’18 (Magnetic Single Nano-Object Workshop & School) international conference which was held in Nancy (France) from September 25th to September 27th 2018. The poster entitled "Engineering of Amplitude and Bandwidth of THz Radiation of Metallic Spintronic Emitters” received majority of votes from the participants of conference. The 3rd International Advanced School on Magnonics 2018, co-organized by Andrii Chumak and, held in Kiev September 17-21, 2018, was successfully completed. Our PhD student Martin Kewenig was awarded for the best poster at the 3rd International Advanced School on Magnonics 2018 in Kyvi entitled "Realization of a micro-scaled spin-wave majority gate". Our PhD student Michael Schneider was awarded for the best poster at the 21st international conference on magnetism in San Francisco entitled "Bose-Einstein Condensation of Magnons by Rapid Cooling". Our group takes part in the SPP2137 Skyrmionics. AG Magnetismus will explore thermal and externally driven skyrmion excitations by Brillouin Light Scattering Spectroscopy. 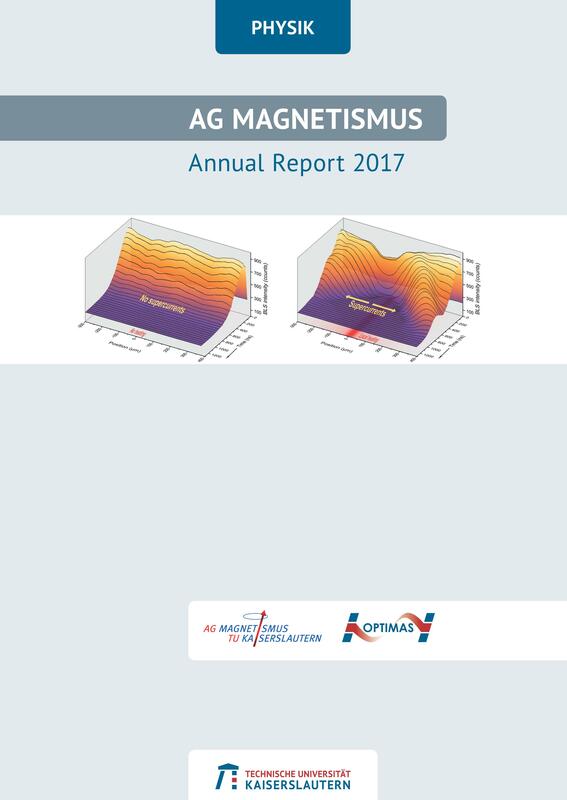 In the frame of the Project, AG Magnetismus has an open PhD position. Interested candidates are welcome to contact the principle investigators Dr. Philipp Pirro and Dr. Thomas Brächer. the 7th Workshop of the Core-to-Core Project Tohoku - York - Kaiserslautern. 4) Scientific program of the Core to Core with the book of abstracts. The conference chair Andrii Chumak and the co-chair Thomas Brächer are happy to announce the Workshop on Nano-Magnonics which will take place in Villa Denis in Diemerstein on February 19-21, 2018. The electronic version of our group's Annual Report 2017 is now available for download! Our article Detection of Short-Waved Spin Waves in Individual Microscopic Spin-Wave Waveguides Using the Inverse Spin Hall Effect is available in Workshop"Magnonics-quo vadis?" Burkard Hillebrands is new Vice President of the Academy of Sciences and Literature Mainz. Our article Bottleneck Accumulation of Hybrid Magnetoelastic Bosons (Phys. Rev. Lett. 118, 237201 (2017)) has been published in Physical Review Letters. Former PhD Student Benjamin Jungfleisch will take up a tenure track position as Assistant Professor in the Department of Physics and Astronomy at the University of Delaware in January 2018. We congratulate him! In ultra-thin magnetic multilayers, the so-called Dzyaloshinskii-Moriya Interaction can lead to a unidirectional propagation of spin waves. 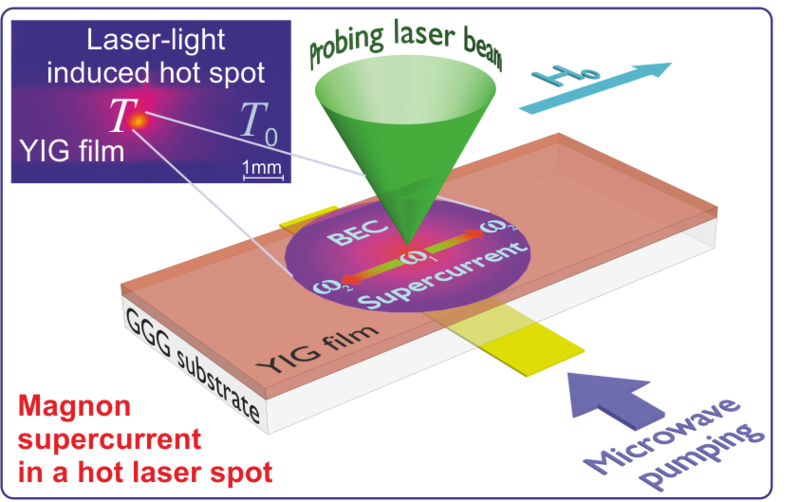 A team of physicists from Kaiserslautern and Mainz has successfully demonstrated such a behavior by means of Brillouin Light Scattering Spectroscopy. Since this method allows to easily determine the strength of the Dzyaloshinskii-Moriya interaction, it is of high interest to various fields such as materials research, fundamentals of magnetism as well as the development of new logic devices based on the utilization of spin waves in information processing. The work is the result of a collaboration between the workgroups of Prof. Hillebrands in Kaiserslautern and Prof. Kläui in Mainz. This research project is embedded in the collaborative research center Spin+X funded by the DFG and has been awarded the Best Poster Award at the recent IEEE International Magnetics Conference Intermag 2017 in Dublin. The electronic version of our group's Annual Report 2016 is now available for download! Our article Spin Seebeck effect at microwave frequencies has been published in Physical Review B. Our Core-to-Core workshop has been successfully completed. We thank all the participants for attending! As a piece of memory, please find below the conference photo. Our article Influence of the MgO barrier thickness on the lifetime characteristics of magnetic tunnelling junctions for sensors has been published in Journal of Physics D: Applied Physics. The AG Magnetismus was recently present at the Hannover Messe 2016, with almost 200.000 visitors being the world’s biggest industrial fair. We presented our industry-related research and other activities at the stand of the State of Rhineland-Palatinate in the hall for Research & Technology. In particular, we presented the results of the successfully concluded STeP project (Spintronic Technology Platform Rhineland-Palatinate) which was recently awarded with the Innovation Award Rhineland-Palatinate 2016 (Innovationspreis Rheinland-Pfalz 2016) in the category 'Cooperation'. STeP is a technology platform to quickly and directly translate scientific findings from physics to industrial standards and it is designed especially to make new technologies accessible to small and medium businesses. The partners have achieved significant progress in the development of novel magnetic sensors. Together with interesting discussions with members of the engineering and sensoric community, we also use our presence at the fair to contact and motivate students for physics and related sciences and to communicate the enormous social payback of research in this field to the general public. Top Left: Dr. Andrés Conca discusses future challenges and opportunities for research in the field of magnetic sensors with Minister E. Lemke (MWKEL) and the director of the magnetic industry association INNOMAG, Dr. J. Gerber. Top right and bottom left: Dr. Philipp Pirro and Viktor Lauer in discussion with some of the visitors. 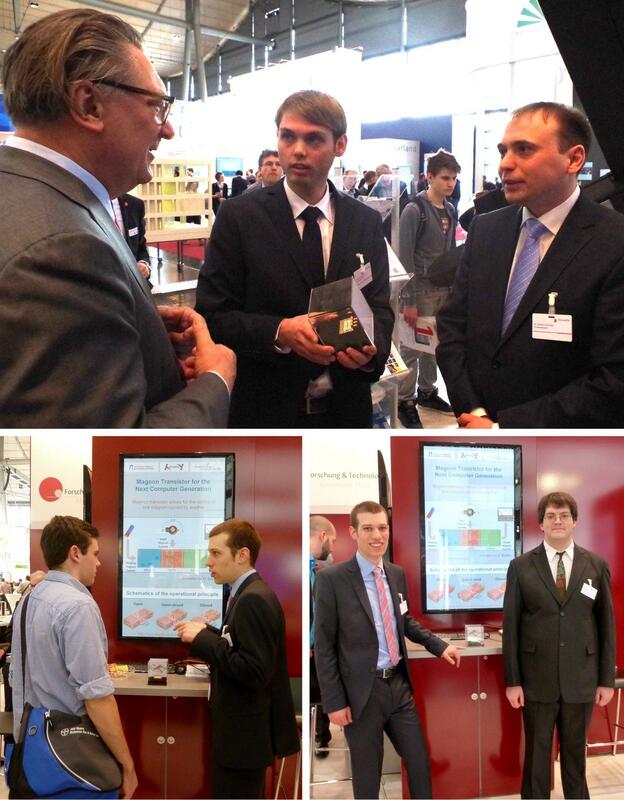 Bottom right: Bobby is happy to represent the TU Kaiserslautern at the Hannover Messe. Burkard Hillebrands receives an ERC Advanced Grant of the European Research Council for his project "Supercurrents of Magnon Condensates for Advanced Magnonics (SuperMagnonics)"
For further information see our press releases here and here (both in German). Our article Light Localization and Magneto-Optic Enhancement in Ni Antidot Arrays has been published in Nano Letters. Our article Study of fully epitaxial Fe/Pt bilayers for spin pumping by ferromagnetic resonance spectroscopy has been published in Physical Review B. Our article Splitting of standing spin-wave modes in circular submicron ferromagnetic dot under axial symmetry violation has been published in Scientific Reports. 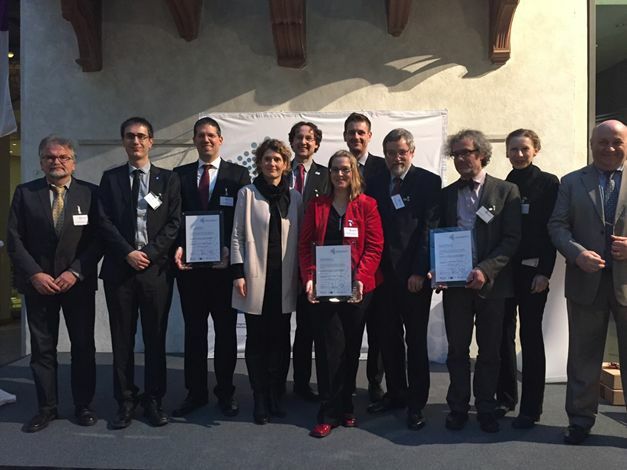 The research project Spintronics Technology Platform in Rhineland-Palatinate (STEP) has obtained the Innovation Award Rhineland-Palatinate 2015 (Innovationspreis Rheinland-Pfalz 2015) in the category Cooperation. The joint project of the TU Kaiserslautern and the University of Mainz (JGU) has been set up with the participation of the company Sensitec in its facilities in Mainz. STeP is technology platform to quickly and directly translate scientific findings from physics to industrial standards and it is designed especially to make new technologies accessible to small and medium businesses. The partners have achieved significant progress in the development of novel magnetic sensors. "These new, energy-efficient sensors are primarily increasingly required for the establishment of industry 4.0 or the Internet of Things" as stated by the Innovation Award. "The research project is a shining example of the great potential that lies in the cooperation between science and industry. The transfer of the latest scientific findings into practice will help our companies in the State to be competive in an international envireonment," said Minister of Economic Affairs Eveline Lemke. The prize is awarded annually by the Minister of Economy, Climate Change, Energy and Regional Planning of Rhineland-Palatinate, Eveline Lemke, in cooperation with the working committees of the chambers of Commerce and Handcraft of the State. The award goes to particularly innovative players in Rhineland-Palatinate in recognition of their achievements and commitment to innovation in the country's economy. The award is endowed with 8,000 euros. Our article Spin-transfer torque based damping control of parametrically excited spin waves in a magnetic insulator has been published in Applied Physics Letters. The electronic version of our group's Annual Report 2015 is now available for download! The Deutsche Forschungsgemeinschaft (DFG) has approved funding for the SFB/Transregio 173 "SPIN+X: Spin in its collective environment“. This initiative has been initiated by the TU Kaiserslautern jointly with Johannes Gutenberg University Mainz. Project start for the first four-year funding period is January 1, 2016. The inter-disciplinary SFB/Transregio 173 SPIN+X combines the expertise of research groups in physics, chemistry, and mechanical and process engineering to form a coherent platform dedicated to the rapidly growing discipline of Advanced Spin Engineering. Our research group contributes three projects to this exciting new funding program. For further information see here (in German). 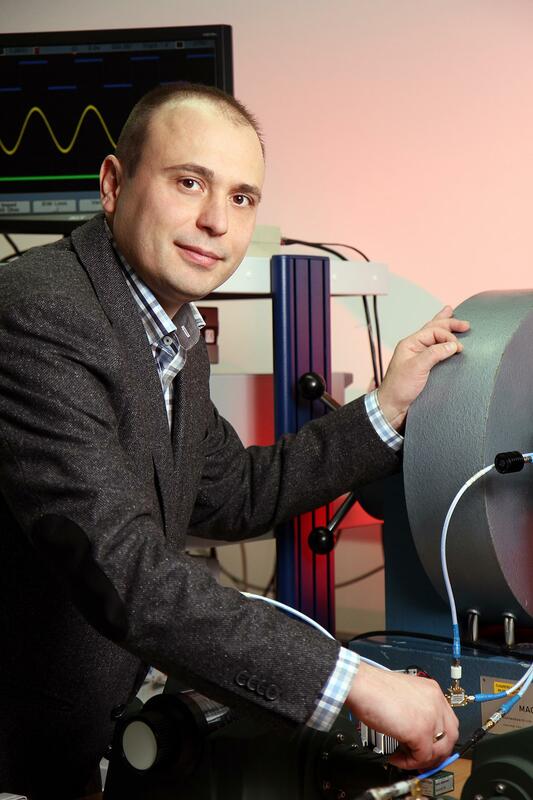 Our co-worker Dr. Andrii Chumak receives an ERC Starting Grant from the European Research Council for his project “Nano-Scale Magnonic Circuits for Novel Computing Systems”. This 1.5 Mio Euro grant is the most-prestigious grant the European Commission awards to young scientists. 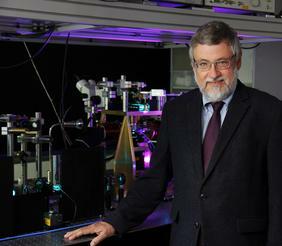 With this grant Andrii will build his own research team including a new Brillouin light scattering laboratory. On October, 1st, female students from high schools all over Rhineland-Palatinate visited our labs in order to get a general understanding about studying physics. They came to our University in the context of the "Schülerinnen-Tag. Natur Wissenschaft Technik". We provided the girls with a lively program: Interactive experiments, a lab-tour, and a short sample lecture on magnetism and our research. We enjoyed to have them with us and hope to see them in the future as fellow students! 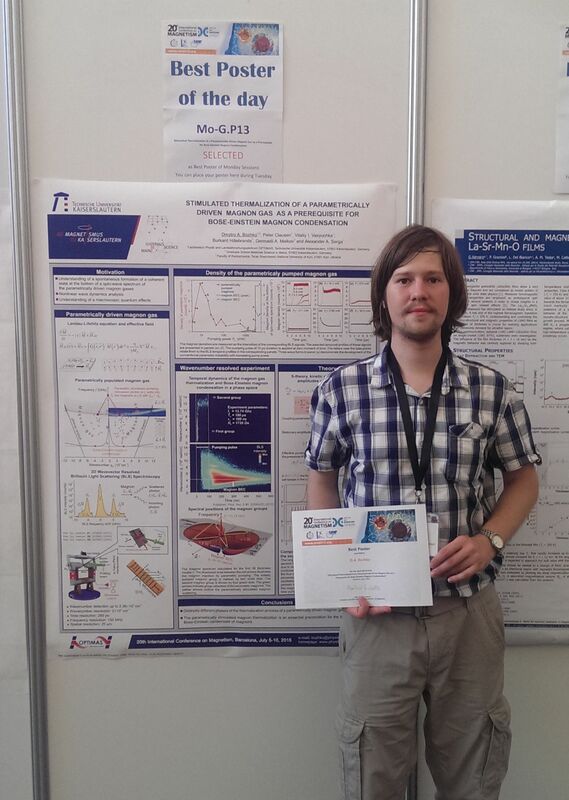 Our PhD student Dmytro Bozhko has been awarded the Best Poster Award of Monday's Session on the ICM 2015 conference in Barcelona. He and his coworkers presented the latest results on their research on Magnon Bose-Einstein condensates. Dr. Philipp Pirro, who did his PhD in our group, was awarded the "Preis des Freundeskreises" for his outstanding dissertation on the linear and nonlinear interaction of spin waves in magnetic microstructures. The Freundeskreis grants this price to excellent young researchers from all departments. Our article "Detection of spin waves in permalloy using planar Hall effect" has been accepted for publication in Physical Review Applied. Our article "Experimental observation of the interaction of propagating spin waves with Néel domain walls in a Landau domain structure" has been accepted for publication in Applied Physics Letters. Our article Stimulated Thermalization of a Parametrically Driven Magnon Gas as a Prerequisite for Bose-Einstein Magnon Condensation has been published in Physical Review B.
Magnon spintronics is the field of spintronics concerned with structures, devices and circuits that use spin currents carried by magnons. The use of magnons allows the implementation of novel wave-based computing technologies free from the drawbacks inherent to modern electronics, such as dissipation of energy due to Ohmic losses. Logic circuits based on wave interference and nonlinear wave interaction can be designed with much smaller footprints compared with conventional electron-based logic circuits. In our review we introduce the basic properties of magnons and their handling and we discuss the inter-conversion between magnon currents and electron-carried spin and charge currents. In addition, concepts and experimental studies of magnon-based computing circuits are presented. Magnon spintronics (REVIEW ARTICLE), A.V. Chumak, V.I. Vasyuchka, A.A. Serga and B. Hillebrands, Nature Physics,11, 453 2 JUNE 2015, DOI: 10.1038/NPHYS3347. A press release (in German) is available here. Our article Spin-wave logic devices based on isotropic forward volume magneto-static waves has been published in Applied Physics Letters. Our article The role of the non-magnetic material in spin pumping and magnetization dynamics in NiFe and CoFeB multilayer systems has been published in Journal of Applied Physics. Left: Model of the Taipei 101 building in Taiwan for the demonstration of positioning sensors based on magnetoresistive technologies (Courtesy of ELGO Electronics). Right: Thomas Langner (top) and Dr. Andrés Conca (bottom) discuss with some visitors about the application of magnetic sensors. As in former years, AG Magnetismus was also recently present at the Hannover Messe, with 220.000 visitors the world’s biggest industrial fair. Together with the Johannes Gutenberg University, we presented our industry-related research and other activities at the stand of the State of Rhineland-Palatinate in the hall for Research & Technology. We presented the STeP project (Spintronic Technology Platform Rhineland-Palatinate) that was recently successfully concluded. STeP focuses on magnetic sensors for industrial automation, automotive industry or robotics. The project makes use of magnetoresistive technologies for the development of new sensor designs. The main activities are performed at the facilities of Sensitec GmbH in Mainz. Sensitec is a world leader for magnetic sensors and contributes with its expertise and know-how in this field. The project complements the Service Center for New Materials (TT-DINEMA), located at Mainz and also presented in the fair. In addition, we presented some of our educational activities to students and the general public which take place in the framework of the Magnetism Network of the Great Region (GRMN). In this network, the Universities of Lorraine, Saarland and Kaiserslautern offer joint technology transfer between universities and industry. The education of experts, as well as of the general public is one of the main goals of GRMN. At Hannover, we presented a model of the Taipei 101 tower as demonstrator on how magnetic sensors can solve technological problems and generate new application fields. The demonstrator was produced in collaboration with the company ELGO Electronics, responsible for the elevators' positioning system in the Taipei 101. For the positioning the presented model uses the same sensors as the elevators in the real building. All-optical characterisation of the spintronic Heusler compound Co2Mn0.6Fe0.4Si. This particular issue is a free issue until July, 13th, 2015! The magnon transistor technology can serve as a key feature to enable the development of magnon-based wave logic computing devices. Our group presented a prototype of such a magnon transistor to the international public at the CeBIT 2015 exhibition, the world's largest trade fair on information technology. Do you want to obtain a general understanding about magnonics, one of our main research topics? B. Leven, A. V. Chumak, B. Hillebrands: "Magnonen für den Computer von Übermorgen"
Our article "A spin-wave logic gate based on a width-modulated dynamic magnonic crystal" has been published in Applied Physics Letters. Photo from left to right: Dr. F. Casper (Uni Mainz), Dr. R. Lehndorff (Sensitec), Dr. M. Dorms (Sensitec), Prof. Dr. M. Kläui (Uni Mainz), the Minister of Rhineland-Palatinate V. Reiß (MBWWK), Dr. A. Conca (TU Kaiserslautern), J. Rühl (LTI Drives), Dr. B. Leven (TU Kaiserslautern), Prof. Dr. B. Hillebrands (TU Kaiserslautern), Dr. J. Gerber (director of the magnetic industry association INNOMAG), Dr. R. Slatter (Sensitec, CEO). The conclusion meeting for the Spin Technology Platform (STeP) took place on February, 12, at the facilities of our industrial collaborator Sensitec in Mainz. Together with the Johannes Gutenberg University in Mainz, STeP aims to the development of new concepts and measurement methods for the magnetic sensor technology. STeP is a clear example of technology transfer between universities and industries, where relevant results on lab level are prepared to be converted into real applications. The magnetic sensor technology finds application in the automotive industry, in robotics or for industrial automation processes. During the meeting, the main scientific results were presented to a delegation of people from the industry and politics. In the center of the photo above, a model of the elevators system of the Taipei building in Taiwan is shown. This model explains an example of a real application of magnetic sensors for positioning and contains the same sensors used in the actual building in Taipei (courtesy of ELGO Electronics, developer of this system). In addition, the partner project TT-DINEMA (Technology Transfer Service Centre for New Materials) was also presented. The aim of the TT-DINEMA project is to establish a service center for new material concepts for various fields, ranging from solar technology through medical technology to thermoelectrics. The electronic version of our group's Annual Report 2014 is now available for download! Our article "Time- and power-dependent operation of a parametric spin-wave amplifier" has been published in Applied Physics Letters. Our article "Measurements of the exchange stiffness of YIG films using broadband ferromagnetic resonance techniques" has been published in Journal of Physics D: Applied Physics. Our article "Sign of inverse spin Hall voltages generated by ferromagnetic resonance and temperature gradients in yttrium iron garnet|platinum bilayers" has been published in Journal of Physics D: Applied Physics. Our article "Non-Gilbert-damping Mechanism in a Ferromagnetic Heusler Compound Probed by Nonlinear Spin Dynamics" has been accepted for publication in Physical Review Letters. Our article "Design of a spin-wave majority gate employing mode selection" has been accepted for publication in Applied Physics Letters. The prestiguous Visiting Professorship of the Graduate School of Excellence MAINZ was awarded to our close collaborator Prof. Andrei Slavin (Oakland University, Rochester, MI, USA). For further infomation see here. Award Ceremony at the Johannes-Gutenberg University on October 6, 2014: Awardee Professor Slavin (middle) together with the MAINZ Director Professor Kläui (left) and the Kaiserslautern MAINZ Coordinator and host of Professor Slavin, Professor Hillebrands (Picture: Frank Wiedemeier). Our group provides high school students during the Schülerinnentag (Event for female high school students) with hands on experience in experiments about magnetism. Our manuscript "Microwave-induced spin currents in ferromagnetic-insulator|normal-metal bilayer system" has been published in Applied Physics Letters. Our article "Magnon transistor for all-magnon data processing" was published in Nature Communications. For the German press release about it see here. Our article Magneto-Optical Enhancement in Co/Au Patterned Nanostructures has been published in the Journal of Surfaces and Interfaces of Materials. "The 2014 Magnetism Roadmap", a topical review paper in which world’s leading experts present their vision of the future of Magnetism in general, has been published in Journal of Physics D: Applied Physics. Our PhD student Thomas Meyer received the Student Poster Award at the ICMM 2014 conference (Sendai, Japan) for the poster "Control of the Effective Damping in Heusler/Pt Microstructures via Spin-Transfer Torque" by him and his co-workers. Our article "Ultrafast magnetization dynamics in Co-based Heusler compounds with tuned chemical ordering" has been published in New Journal of Physics. Our article "Role of bulk-magnon transport in temporal evolution of the longitudinal spin Seebeck effect" has been published in Physical Review B. Our former PhD student Benjamin Jungfleisch has received a Ph.D. Award of the Kreissparkassen-Stiftung Kaiserslautern. Benjamin is currently a postdoc at Argonne National Labs (U.S.A.). 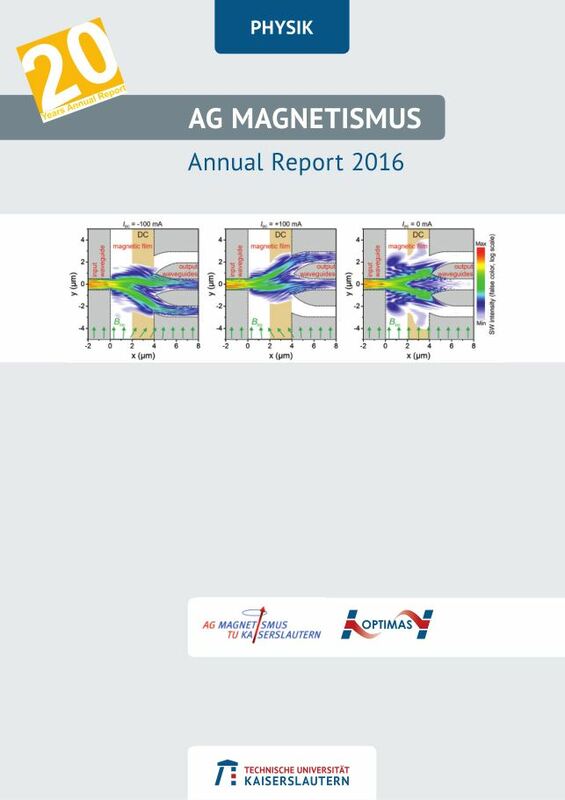 GRMagNeto available for download : A new application for iPhone, iPad und iPod for recording the 3 components of a magnetic field was developed in the framework of the GRMN project. Our article "Ultrafast magnetization dynamics in Co-based Heusler compounds with tuned chemical ordering" was accepted for publication in New Journal of Physics. Our article Parallel parametric amplification of coherently excited propagating spin waves in a microscopic Ni81Fe19 waveguide has been published in Applied Physics Letters. Our article Magnetoelastic modes and lifetime of magnons in thin yttrium iron garnet films has been published in Physical Review B. Die Folien zur Ringvorlesung vom 15.05.2014 sind jetzt verfügbar. Our article Annealing influence on the Gilbert damping parameter and the exchange constant of CoFeB thin films has been published in Applied Physics Letters. Our article Realization of a spin-wave multiplexer has been published in Nature Communications. Dr. Helmut Schultheiß, who did his Ph.D. in our group, was recently awarded the prestigious Emmy Noether Grant by the Deutsche Forschungsgemeinschaft. - Magnetism-Network of the Greater Region (GRMN). 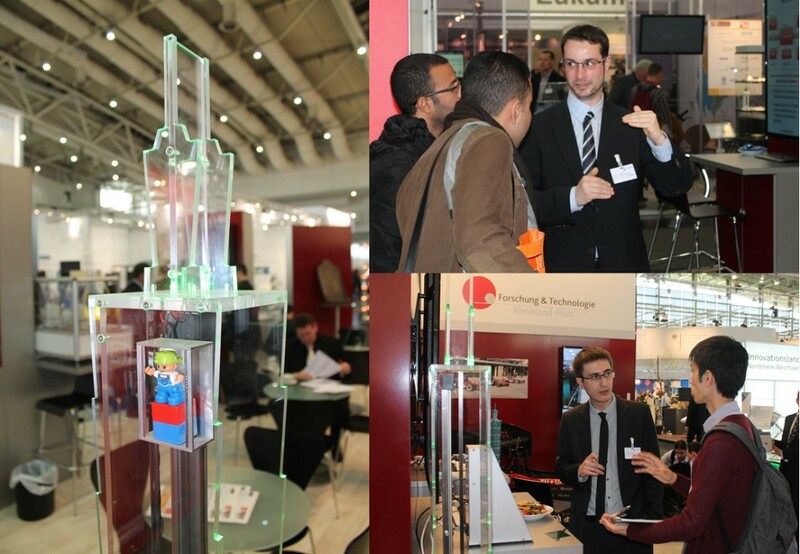 at Hannover Messe 2014, the worldwide largest fair for industrial technology. Our cooperation partner Prof. Dr. Stuart Parkin was awarded the Millenium Technology Prize 2014, the most important award for technological innovations. - Magnetism-Network of the Greater Region. (GRMN). Our article Bose–Einstein condensation in an ultra-hot gas of pumped magnons has been published in Nature Communications. Our article Localized parallel parametric generation of spin waves in a Ni81Fe19 waveguide by spatial variation of the pumping field has been published in Applied Physics Letters. Our article Spin-wave excitation and propagation in microstructured waveguides of yttrium iron garnet/Pt bilayers has been published in Applied Physics Letters. Our Annual report 2013 is available online. Our article Explosive electromagnetic radiation by the relaxation of a multimode magnon system has been published in Physical Review Letters. Our article Optimizing the spin-pumping induced inverse spin Hall voltage by crystal growth in Fe/Pt bilayers has been published in Applied Physics letters. Thomas Sebastian has successfully passed his oral exams of his PhD thesis. Congratulations! Matthias Benjamin Jungfleisch has successfully passed his oral exams of his PhD thesis. Congratulations! Björn Obry has successfully passed his oral exams of his PhD thesis. Congratulations! Our article Localized parametric generation of spin waves in a longitudinally magnetized Ni81Fe19 waveguide has been published in Applied Physics Letters. Katrin Vogt-Schultheiss has successfully passed her oral exams of her PhD thesis. Congratulations! Thomas Sebastian (Phd student in our group) received the Best Poster Award at the annual meeting of the Japanese-German research unit ASPIMATT held on July 4-5 in Dresden, Germany. Professor Genadii Melkov (Taras Shevchenko National University of Kiev, Kiev, Ukraine) has joined our group until the end of August in the framework of TRR49. Professor Stuart S.P. Parkin (IBM Fellow at the IBM Almaden Resaerch Center) was awarded with a Honorary Doctoral Degree by TU Kaiserslautern for his pioneering work on spintronics. The second funding period of the joint Japanese-German Research Unit (Forschergruppe) third annual project meeting and a summer school will take place in Dresden, July 1 - 5. We gratefully acknowledge financial support by JST and DFG.